Bible lessons and ideas about Jesus and the Man Let Down Through the Roof -with Art, craft, painting, construction, drawing, etc. We did this story last year in Rotation and had a very successful ART Project. Using shoeboxes, the kids made their own story telling kits. They made the house, clothespin people, lame man, his friends, the stretcher. Sticks were glued around a hole cut in the shoebox. The shoebox was laid on its side creating a little theater. We opened with basic bible study of the story then made the kits and practiced retelling the story. After the pieces were assembled, we all gathered in pairs to retell the story to our partner. The kids were encouraged to use their kit to retell the story to a parent or sibling or friend. We closed with a prayer to help us do it and help the person we told the story to want to be close to Jesus. 1. It's a miracle that Jesus can forgive sins! Only God can do that, and having your sins forgiven is the biggest 'healings' a person can ever have. 2. The miracle of the man's friends, who believed in Jesus enough to go the extra effort and risk offending the crowd to help their paralyzed friend. As a Reflection Activity, have students write as many sins as they can think of on a long long BANDAGE. Then wrap a student in that bandage so they can't move. Discuss how our sins keep us from living life the right way. Discuss how our sins can "make us fall" (which should be metaphorically obvious if you have wrapped the student's legs together!). Then ask about "how Jesus heals us by forgiving us". Begin to unwrap the students. But also take the opportunity to demonstrate that our "healing" doesn't mean we can't re-bandage ourselves, get ourselves in a bind again with our sins. The difference is that God no longer counts our sins against us, and wants to help us live forgiven lives. This is an important nuance! The children will create a storytelling kit to retell the story to parents, siblings, and friends. 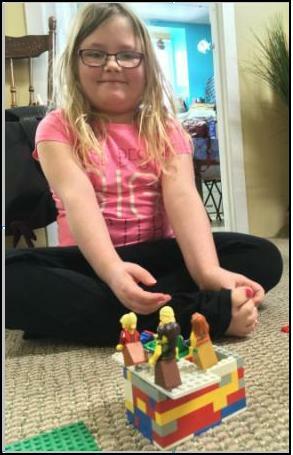 In retelling the story to others, the children experience another way to bring people to Christ. Retell the story using a storytelling kit. Understand that telling the stories of Christ is a way to bring people to Jesus. The bin with supplies is located in the Sunday School classroom area. Collect shoeboxes (sample letter above). Precut holes/flaps in the boxes. Precut construction paper for mats. Set the clothes pins, markers, craft sticks, and 2”x 4” construction paper rectangles for making the story telling kits out on the tables in the art room. 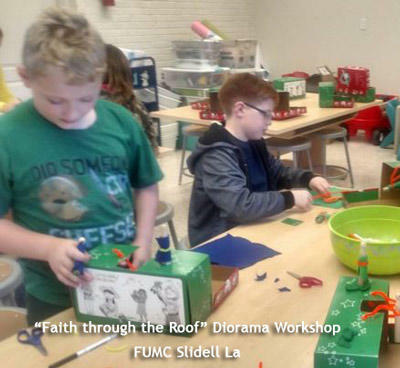 Explain the purpose of this workshop: Today you are going to make a storytelling kit to help you retell the Bible story about Jesus to people you know. Telling others the stories about Jesus is a way that you can bring people to Jesus. Before telling the story show the children how to find the passage in the Bible using your Bible. (Do not have the children do this themselves as they usually do during the Bible story time.) Review the organization of the Bible: The Bible is divided into two big parts, the Old and New Testaments. Each part is a collection of books. Each book is divided into chapters and verses. Show them that if they open their Bible in the middle, they will usually land in the book of Psalms in the OT. Point out that the book name is at the top of each page. Tell them that Mark is the second book of the New Testament and it come after Matthew. After they have found Mark tell them to find Mark 2:1-12. Some of the children may confuse chapters and verses. Show them that chapter numbers are the big ones, and also are at the top of every page (in most editions). After showing them how to find the passage, set your Bible aside and tell the story using the story telling kit you made prior to class. Before the children move to the tables, give them instructions for making the stretcher and people. For the stretcher they will use a glue stick to put glue on one side of two craft sticks. Lay the craft sticks parallel to each other about an inch apart with the glue facing up. Lay a 2”x 4” construction paper rectangle down on the sticks with the long sides of the rectangle even with the edge of the craft sticks on each side. The ends of the sticks should be sticking out of the ends of the paper. Set the stretcher aside to dry. To make the people, the children will use markers to draw facial features and clothes on the people. 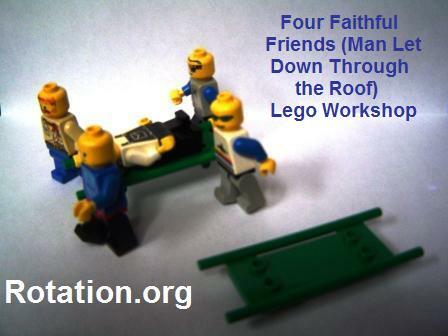 They will make four friends, one paralytic man, and Jesus. By the time the children have made their people the stretchers will probably dry so they can tie a string to the each of the four ends of the sticks. The string should be about 12 inches long. Who are the people who brought us to Jesus? How did they bring us to Jesus? Who could we bring to Jesus? What things about this story amazed you? What things about this story confused you? Divide the children into pairs and have them take turns practicing telling the story to each other using their kits. This is a critical part of this lesson. Please keep an eye on the time and make sure it happens! Congratulate all on a job well done! Tell them that they should tell the story to at least one more person today so it will be truly “theirs” (that is, they will have learned it by heart). On your journal page draw a picture or write the name of the person you are going to use your story telling kit with to tell the story of the Four Faithful Friends. Also draw a picture or write the name of people who have brought you to Jesus. Thank God for the people who have brought these children to Jesus and ask God to give them good recall of the story to tell to others so that they can bring people to Jesus. Consider having them add chenille-stem arms to the clothespin puppets. For classes composed primarily of pre-readers, show the children how to find the passage in the Bible (for example, “To find the Gospels, open the Bible in the middle and then open the second half in the middle - you should end up in Matthew, Mark, Luke, or John. Our passage is in Mark." and then have them do it. After everyone has found the passage, have them close their Bibles and listen while you read. Children in this age group will have a variety of abilities with small motor skills. Be ready to help before someone gets frustrated. Congratulate effort, not results. Leave off the string for lowering the mat. They can just pretend there are ropes (this will eliminate tangled string frustrations). You will probably want to do this for all but the very oldest group. Instead of having them retell the story to partners, divide the class into groups so that you have one adult for each group to “moderate” the retellings. Ask each child in the group to retell the story using his or her kit. Or if no one wants to tell to the group, lead the entire small group in a simultaneous retelling and demonstration of the story (do this several times if no one wants to solo). Kosmachuk, Joan Dower; Hide God’s Word in Young Hearts; Standard Publishing, Cincinnati, Ohio, 1990. From an idea posted by Neil MacQueen rotation.org. From an idea posted at rotation.org by member Catherine, Kirk of Kildaire. Books that show Middle Eastern Architecture: these and more are available at the library. Copyright 2003 Jamie Senyard. Posted by Amy Crane. Permission granted to freely distribute and use, provided the copyright message is included. My students really enjoyed making the diorama. Without a visual I had some trouble with how to make the pallet suspended. A student creatively figured a way and we copied her. We used the regular clothespins because it stood better. Used a glue gun to stand up the people I found a stretcher in the church and the kids loved carrying someone in it. Next Sunday we will do the memorization lesson and talk more about what we did last week. Photos added by a volunteer moderator, send your pix from a lesson to contact.rotationATgmailDOTcom. I like how the folks at Eastwood Baptist Church showed the bits of the roof on the floor! Kathy EssonLesson Wrangler (100+ pts) a Supporting Member! We are doing this as the Art Station; and doing the Art Station concept of building houses ... instead of cardboard boxes, we have a Lego Station and will use Legos to tell the story. That's a great idea Kathy. Have the kids build their house and then ask them to retell the story. Take some pictures please! Kathy, loved your idea to adapt the above Art/Diorama/Storytelling Workshop to incorporate Lego - building the house and then having the kids retell the story. You could also video tape each retelling with a camera or phone. 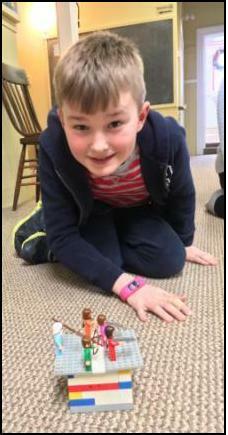 Using the above lesson we opened with a retelling of the story using the wooden house (pictured below) which was built by someone in our church years ago and I used a Playmobil soccer player set which included a stretcher, the other characters in that shot are Tales of Glory figures,. 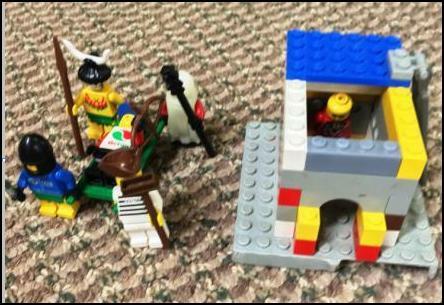 Then the kids built their Faith Through the Roof Scenes with Lego. Our kids loved this workshop. 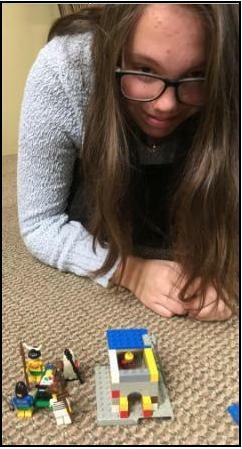 You can purchase new or used "Lego Stretchers" (in white or green) from www.bricklink.com. I ordered several Lego Stretchers from www.bricklink.com. Here is a picture of the stretcher. I set one up being carried by the four friends. In Search box enter - 4714 (this is the part number). List will come up look under Parts - click on the item #4714. Scroll down to bottom of page where it says 25/page - change to 200/page (nothing will happen yet). Scroll up to Sort-lowest price - and change to -Highest Qty. It will now list sellers with their stock on hand. Scroll down until you find someone located near you (cheaper for shipping), with the Qty you need. Note: some sellers have a minimum buy $ amount, some none (all prices in U.S. funds). They are inexpensive so buy several so each child (or group) can retell the story.